Archaeologists digging just south of Jerusalem’s Temple Mount have made a historic discovery, unearthing the first-ever seal impression of an Israelite or Judean king ever exposed in situ in a scientific archaeological excavation. The discovery, made during Ophel excavations at the foot of the southern wall of the Temple Mount, is an impression of the royal seal of the Biblical King Hezekiah, who reigned between 727–698 BCE. The sc‎ript is accompanied by a two-winged sun, with wings turned downward, flanked by two ankh symbols symbolizing life. Watch – King Hezekiah’s seal: what does it tell us? Experts identified several other subtle details about the artifact, surmising that it was originally used to seal a document written on a papyrus scroll which was then rolled and tied with thin cords, leaving their mark on the reverse of the bulla. The bulla was discovered in a refuse dump dated to the time of King Hezekiah or shortly after, and originated in the Royal Building that stood next to it and appears to have been used to store foodstuffs. The building, one of a series of structures that also included a gatehouse and towers, was constructed in the second half of the 10th century BCE (the time of King Solomon) as part of the fortifications of the Ophel – the new governmental quarter that was built in the area that connects the City of David with the Temple Mount. The bulla was found together with 33 additional bullae imprinted from other seals, some bearing Hebrew names, their reverse also showing marks of coarse fabric and thick cords that probably sealed sacks containing foodstuffs. 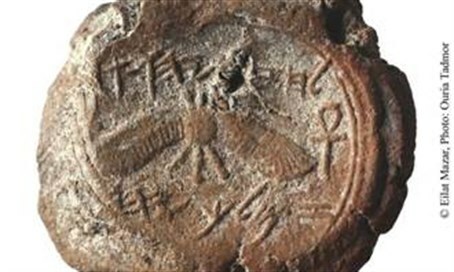 “Although seal impressions bearing King Hezekiah’s name have already been known from the antiquities market since the middle of the 1990s, some with a winged scarab (dung beetle) symbol and others with a winged sun, this is the first time that a seal impression of an Israelite or Judean king has ever come to light in a scientific archaeological excavation,” said Dr. Eilat Mazar, a leading Jerusalem archaeologist whose landmark discoveries include an ancient golden treasure at the foot of the Temple Mount. King Hezekiah is considered one of Judea’s most righteous kings, and is described favorably in the Bible (II Kings, Isaiah, II Chronicles) as well as in the chronicles of the Assyrian kings – Sargon II and his son Sennacherib – who ruled during his reign. Hezekiah is depicted as both a resourceful and daring king, who centralized power in his hands. Although he was an Assyrian vassal, he successfully maintained the independent standing of the Judean Kingdom and its capital Jerusalem, which he enhanced economically, religiously, and diplomatically. The symbols on the seal impression from the Ophel suggest that they were made late in his life, when both the Royal administrative authority and the King’s personal symbols changed from the winged scarab (dung beetle) – the symbol of power and rule that had been familiar throughout the Ancient Near East, to that of the winged sun – a motif that proclaimed God’s protection, which gave the regime its legitimacy and power, also widespread throughout the Ancient Near East and used by the Assyrian Kings. This change most likely reflected both the Assyrian influence and Hezekiah’s desire to emphasize his political sovereignty, as well as Hezekiah’s own profound awareness of the powerful patronage given his reign by the God of Israel. While the changed Royal administrative symbol imprinted on the King’s jars used the motif of a sun with wings extended to the sides, Hezekiah’s personal changed symbol had a sun with sheltering wings turned down and a life-symbol at the end of each wing. This special addition of the symbol of life may support the assumption that the change on the King’s personal seal was made after Hezekiah had recovered from the life-threatening illness of shehin (II Kings 20:1-8), when the life-symbol became especially significant for him (ca. 704 BCE).